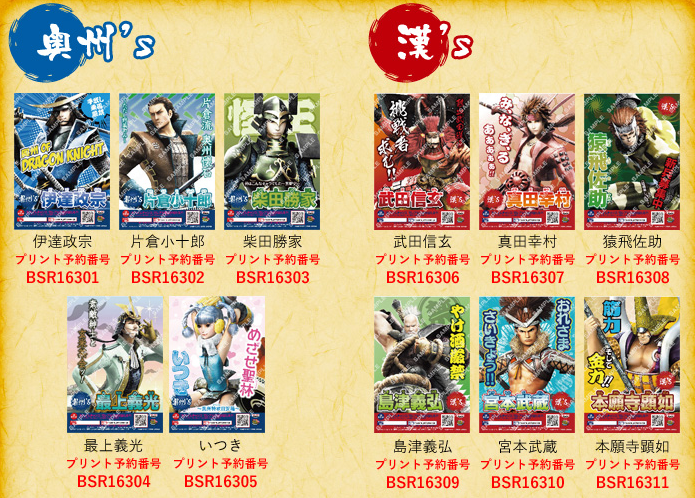 Well, I think we know why there was so little news at Basara Matsuri - there's not been all that much to report lately! That ought to change in a few weeks when the promised character details for Sengoku Basara: Yukimura-den finally appear in the gaming press. Until then, I'm scraping the bottom of the barrel for new gossip. I mentioned before that the official fan club newsletter had promised some content about the game, but after receiving my copy it became apparent that there really wasn't much worth mentioning. The interview mostly repeated content from previous articles. Perhaps more interesting was a two-page timeline introducing fans to the major events in Yukimura's life as a primer for the game. It's a stretch, but maybe this will help narrow down which of the many accomplishments of the Sanada clan will be covered in Yukimura-den. Since it's commonplace historical information I can't imagine that anyone at Capcom will get mad if I translate the details. 1567: Sanada Yukimura was born to Sanada Masayuki and Yamanote-dono, and given the childhood name Benmaru. Not much is known about his place of birth, but as they served Takeda Shingen it's been theorised that Yukimura may have been born in Koufu. Incidentally, Date Masamune was born the same year. 1575: The Takeda army was defeated by the combined Oda-Tokugawa forces in the Battle of Nagashino. After Sanada Nobutsuna was killed in battle, Sanada Masayuki succeeded him as head of the Sanada clan. 1582: The Battle of Nagashino led to the decline of the Takeda clan and its eventual downfall. From that point on, the masterless Sanada clan experienced suffering on a daily basis. Masayuki went from serving the Oda clan to the Houjou, and then the Tokugawa, desperately trying to survive against the backdrop of the Sengoku period. 1584: Tokugawa Ieyasu stood against Toyotomi Hideyoshi. Ieyasu decided to make peace with the Houjou clan, and the territory of Numata was to act as a peace offering. However, Numata was an area which Sanada Masayuki had put a lot of effort into conquering and he wasn't willing to hand it over to Ieyasu. Masayuki declared that "Numata is a land we claimed with bows and arrows. It's not a land given to us by Tokugawa-dono." and refused to surrender the territory. Ieyasu was vying with Hideyoshi for control of the entire country and this act of defiance caused a rift between the Tokugawa and Sanada. In need of support, the Sanada clan became retainers to the Hideyoshi-backed Uesugi clan. 1585: The broken relationship between the Tokugawa and Sanada clans led to the Battle of Ueda, where the Tokugawa army attacked the still-unfinished Ueda Castle and the Sanada clan within it. The Tokugawa forces were able to approach the castle with very little resistance - but this was all part of Masayuki's plan. When the Tokugawa troops arrived at the area surrounding the castle, the buildings nearby were set alight. At the same moment, guns were fired from inside the castle and peasant soldiers attacked from all sides. The Tokugawa forces were completely overwhelmed. Having successfully repelled the great Tokugawa army, word of the Sanada clan's military prowess spread throughout the land. 1589: Houjou clan retainer Inomata Kuninori disregarded a ruling from the Toyotomi clan and attacked Nagurumi Castle in the west of the Numata region. When Masayuki brought the matter to Hideyoshi's attention, he was infuriated and declared war on the Houjou clan. Warlords from across the country were called into action and the Siege of Odawara began. Sanada Yukimura participated in the battle along with his father Masayuki and brother Nobuyuki; this was Yukimura's first campaign. 1598: Hideyoshi passed away, and the Sanada clan - now with the status of daimyou - were thrust right back into the heart of conflict once again. 1600: At last, Ieyasu made his move and the Battle of Sekigahara divided the nation. The members of the Sanada clan discussed the stances they would take; Yukimura and Masayuki sided with the Western Army but with his wife being the daughter of Honda Tadakatsu, Nobuyuki sided with the Eastern Army. Yukimura and his elder brother were therefore on different sides. This split wasn't due to a quarrel but a decision made with mutual respect for each man's position and viewpoint. Yukimura and Masayuki fought well together and accomplished much, yet in spite of this the Western Army was defeated. Thanks to Nobuyuki and Honda Tadakatsu the pair were spared death, instead being confined in Kudoyama at the base of Kii Province's Mount Kouya. 1611: Sanada Masayuki passed away in Kudoyama, aged 64. 1614: Having seized the country, Ieyasu's final concern was the Toyotomi clan. In order to destroy them he gave orders to attack Osaka in the campaign known as the Osaka Winter Siege. The Toyotomi clan called upon the Sanada clan to assist them at Osaka Castle, and thus Sanada Yukimura finally left Kudoyama. Although the Toyotomi were at a disadvantage, Sanada Yukimura's squad was their sole glimmer of hope. Yukimura identified a weak spot on the south side of Osaka Castle and constructed a fort to reinforce that location; this fort would later be known as the Sanadamaru. When the Eastern Army attacked the Sanadamaru, they were repelled by Yukimura's shrewd orders and expert command of his gunners. Ieyasu came up with a different plan upon seeing that brute force wasn't going to bring him victory. The Osaka Winter Siege came to an end with a declaration of peace between the Toyotomi and Tokugawa clans. 1615: Ieyasu pressed Yukimura to switch sides, but Yukimura paid him no attention and dismissed the 100,000 koku territory comprising the land of Shinshuu he was offered as a reward. His determination would have evoked memories of his father, Masayuki. Meanwhile, the Toyotomi clan feared another clash would be unavoidable and began stocking up on battle provisions and ammunition, secretly preparing for war. Word of this soon reached the Tokugawa clan, who were already looking for an excuse for a rematch. Ieyasu demanded that Hideyori demonstrate his allegiance by requesting to be relocated from Osaka Castle and banishing the gathered ronin. Of course, there was no way that the Toyotomi could accept this. The bonds between the East and West were severed once again and the Osaka Summer Siege began. Yukimura set his sights on Ieyasu and the Sanada troops united for an assault. They overwhelmed their enemies and eventually reached Ieyasu's hatamoto; so fierce was the Sanada charge that Ieyasu steeled himself for death. However, as the power of the Sanada forces gradually started to wane they were unable to take Ieyasu's head, and the Eastern Army regained their momentum. The exhausted Yukimura sat down to rest in the grounds of Yasui Shrine, where a thrust from Nishio Munetsugu's spear brought his life to an end. There was one interesting comment in the official Q&A corner too. It's not specific to Yukimura-den but this question comes up a lot, so it's nice to seeing it getting a response from the staff even if it's not definitive. Q. Is there a chance we'll see the characters' sons or daughters in the future? A. Maybe if the series continues long enough...? 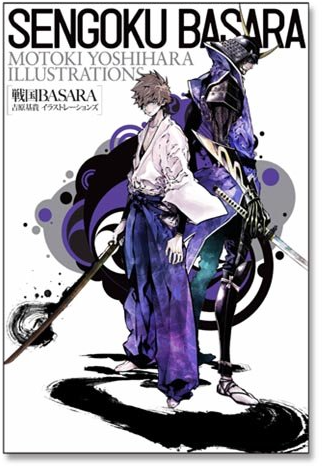 Setting the new game aside, here are the usual news updates and announcements from elsewhere in the Sengoku Basara world. Bizarre series mascot character Ashigaru-kun has kindly prepared a photo report for those of us unable to attend the Sengoku Basara 10th Anniversary Matsuri ~Feast of Ten Years, Ten Shades~ event earlier this month. It's not the greatest, but Ashigaru-kun's team are allowed to take pictures in all of the places normal attendees cannot which makes it fun to read. It's not another full Ichiban Kuji lottery (sadly) but there's going to be a smaller campaign called Print Charamide Sengoku Basara ~Jindori Gassen!~ ('Base-grabbing Battle!') running from 1st April until 10th April 2016. It's extremely similar to the previous campaigns of this type. Fans can visit participating 7-Eleven stores and pay ¥150 for the privilege of printing a special Sengoku Basara 'charamide' photo from the multifunction copying machine. The available images are actually rather cool as there's a choice of 66 designs covering 13 different 'armies', which are grouped together in silly, not-entirely-canonical ways as the Oushuus, Manly Men, Conqueror Kings, Bonds, Loves, Demon Lords, Setouchis, Emperors, Kyuushuus, Regional Lords, Three 'Bee's, Tiger-users and Sengoku Gourmet Association. You can see the designs by clicking on the black banner halfway down the page with a red 'Click' label. Each image has its own reservation code which fans can take to the store and key into the copier. Once you've collected your printed charamide you can use the unique code printed on the bottom to enter a mobile lottery on the website before 1st May 2016. Group shots of the two most popular armies will each be featured on prizes for 50 lucky winners. Fans can track the popularity of each army by checking the green banner underneath the designs on 5th April 2016, and the final results will be posted under the red banner on 12th April 2016. That's not all, however! There will be a follow-up event in early July 2016 called Ichiban Kuji MINI Sengoku Basara ~Hisshou Kigan!~ ('Inevitable Victory Prayer!'). The results from the April event will be used to decide which of the 'armies' feature on a variety of omamori mascot charms and ema mascot charms which can be obtained in a ¥500 lottery. The results from the third online Basa-Ranking survey were tallied at the end of February and the details were posted on the website as usual. The survey asked fans which game's story interested them the most. The prize for the winning game are the usual smartphone lock screen images, which can be accessed here. Keiji finally gets to appear on one of the pictures! Details of the next ranking have still not been posted so it looks as though this might be the last one, even though the website encourages fans to look forward to the next ranking. If you prefer albums to singles but still want to own the latest Sengoku Basara: Yukimura-den game's theme song, you'll be pleased to hear that it's going to be included on T.M.Revolution's new 2020 -T.M.Revolution ALL TIME BEST- album when it launches on 11th May 2016. The album celebrates Nishikawa's 20th anniversary since his debut as T.M.R. A generous number of Sengoku Basara tracks can be found in the 3 CD set, which has been remastered in New York. The first press limited edition also includes a slipcase and a DVD with video footage covering the last twenty years 'in 2020 seconds'. The limited edition costs ¥4,920 (a pun which sounds like 'yoro(shiku) 20(th anniversary)' while the standard edition will be ¥3,920 - also a pun, this time of 'thank you 20(th anniversary)'. Special bundles for both versions and a muffler towel will be available through Loppi and HMV. Speaking of the song, there's a short preview available on YouTube in an unofficial capacity for those of us who can't look forward to the radio previews available to fans in Japan. Oh dear, not more SB products which I want to buy getting too hard to obtain, please. Have you seen the SB vs DMC stage play yet Raindrops? I wonder what you think of the ex-Kojurou actor as the ”Dark knight” walking around in tight trousers and acting odd. It totally weirded me out, ha. Kaoru-san on Tumblr noticed that the artbook was also listed on AmiAmi, though it immediately went to 'sold out' status. I guess the best thing to do is keep requesting it; hopefully regular bookstores like CD Japan will eventually be able to find some stock to sell. It's becoming quite annoying how difficult it is to obtain things these days just because the series isn't as popular as it once was. I completely agree, Yukimura would probably be a great father if they ever let him. Or even if they don't, I think he could still be a good role model for a lost soul like Katsuie. The VS stage play is finally sitting on my desk now after a very slow delivery! Your reminder about Yoshida Tomokazu in his glam rock outfit has potentially provided enough motivation to make me move it higher up in my list of priorities (lol). Waaaait, what? Odawara was Yukimura's first campaign!? Writing out the full timeline really helped me keep track of everything in order after all of the different versions of Yukimura's life story I've seen in the past! The fact that they specifically mentioned a few key figures rather than saying "the ___ army did this" makes me hopeful that we might see a few interesting minor NPCs in the game as well as the new characters we're already expecting. Even though the article was clearly introduced as Yukimura's life story it had a strong focus on Masayuki too, so perhaps things will go right the way back and spend a decent amount of time setting up the conflicts which ended up influencing Yukimura so much. I'm glad that writing up the timeline was useful to people other than me! It helped me focus my excitement about the new game a little.